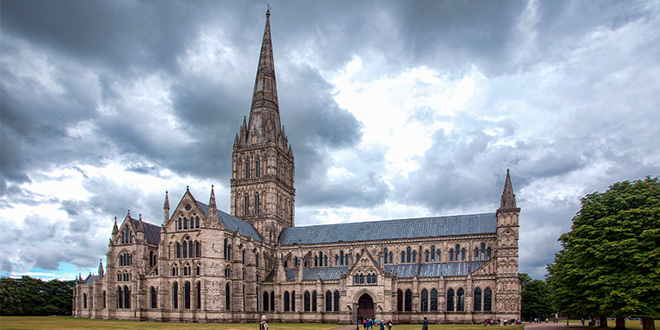 FOR those of you who have visited Salisbury Cathedral, I need not relate the fact that the thirteenth-century spire of the building towers over the surrounding countryside. It is readily visible from the local train station, making it a helpful guiding landmark for any visitor who – like myself – is unable to catch the bus due to budgetary constraints and is instead obliged to walk. Refreshed by his brisk stroll down into the village and onto the Cathedral Close, this same single-minded visitor – readily distinguishable from those other tourists who head straight for that pile of rocks in the middle of Salisbury Plain – is able to participate in a guided tour of the building and its environs. When I was there a few years ago, the guide – making free and ready use of his standard-issue laser-pointer – emphasised the precision of the masonry and the incredibly intricate stone-carvings that drew the eye wherever we looked. The guide then highlighted the fact that some of the very best carvings in the entire cathedral – here the laser-pointed is waved somewhere in the direction of the vaulted ceiling – are ensconced at altitudes so extraordinary that, in effect, no one on the ground will ever see them. This is because the diligent artists who carved these masterpieces were not interested in acclaim or attention from their fellow men and women; they were working for God. Their lives were exquisite expressions of faith in our Heavenly Father who knows all things; they did not feel compelled to draw attention to themselves or what they had done. This truly Christian attitude is certainly something to which we can continue to aspire in our own age and in our own lives. Yet there is a further aspect of their work in the Cathedral that is worthy of note. Not only are some of the best carvings positioned so loftily that people without a capacity for flight will never catch so much as a glimpse of them, many of these exalted stone carvings are deliberately hidden. Even if a person were employing a hover-board to peruse the upper-reaches of the sacred space, he would have to crane his neck and perform some lesser acrobatic manoeuvrers in order to see the carved creatures that occupy these lofty heights. And what form do these hidden creatures often take? These masterpieces of stone-masonry are usually representations of angels. The gothic cathedral is the Catholic view of the cosmos carved in stone – they are imposing monuments in which each element of creation and the history of salvation have a place. The Cathedral contains carved representations of hidden realities – angels – which we who stroll in our pedestrian manner upon the earth cannot see. This is an artistic manifestation of our belief that, although we cannot perceive the purely spiritual beings and realties that surround us, they are nonetheless present. We may not be aware of them, but from on high, they are intimately aware of us and our every movement. The existence of angels – spiritual, non-corporeal beings who act as servants and messengers of God – is a truth of our faith. St Thomas Aquinas – an exact contemporary of the builders and carvers of Salisbury Cathedral – is known as the “Angelic Doctor” of the Church due to his penchant for discussing purely spiritual beings at considerable length within his written work. As I write these words the midday-bell has just rung out from the bell-tower of the church, calling to mind the Incarnation through the recitation of the Angelus. The sheer extent to which our Catholic lives ought to be pervaded by a sense of the spiritual and supernatural is occasionally neglected as a result of the fact that these words and prayers are taken for granted. The Church is thus quite right to call these realities to our attention by assigning specific feasts for their celebration. The Feast of the Archangels Michael, Gabriel and Raphael falls towards the end of September and that of the Holy Guardian Angels in early October. Their very name recalls their inherent role as servants of God: “angel” means “messenger”. Yet our firm belief in these purely spiritual beings has not gone unquestioned by the secular world and – as a result of the mockery and ridicule of those who so often abuse or misrepresent what they do not wish to understand – some Catholics have begun to opine that these “angels” are mere fairy stories. The most famous denigration that secular thought has managed to concoct in this regard is the idea that scholastic theologians of the thirteenth century spent all their time debating, “how many angels could dance on the head of a pin”. Representative of a form of argument that would not be out of place in modern political discourse, that statement misrepresents the reality with which those theologians were grappling. St Thomas Aquinas and his contemporaries did indeed answer questions concerning whether several angels – non-corporeal, purely spiritual beings – can be in the same place at the same time. It would be a tragedy if we were to begin jettisoning elements of the truth simply because those who have no interest in understanding the faith employ their calculated misunderstandings to deliberately misconstrue the substance of what we believe. Indeed, in the face of such objections we are even able to employ some of the very words St Thomas Aquinas himself. Those who do not wish to acknowledge the reality of angels are unable to broaden their limited, terrestrial perspective; they choose to remain on the floor of the Cathedral and never look up. We can accept that the angels peer down from the stone-vaulted ceiling, whether we acknowledge their existence or not. And we can further accept that these beings do not remain detached observers from on high. Recognition of the spiritual and supernatural reality that pervades our lives – developing our sense of the presence of God and his servants and messengers among us – is perhaps the first necessary step towards our being able to live, work and act in the same exemplary vein as those stone-masons of the thirteenth century. For in acknowledging a reality pervaded by God and His servants, we will no longer be tempted to seek recognition and adulation from our fellows. For whatever we do, it will then manifestly be done for the Glory of God.